CANADA — The September 2018 magazine cover rollout has begun. Magazines are bringing their A-game with eye-catching covers. Some issues even weigh more than a pound and has over hundreds of pages. Rihanna covers Edward Enninful‘s British Vogue (see it here), Jennifer Aniston covers InStyle (see it here), Jaden Smith covers Dazed (see it here) and Slick Woods covers Elle UK (see it here). Next up is Tracee Ellis Ross. 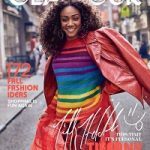 The Hollywood actress covers the September 2018 issue of Elle Canada. The shoot was lensed by photographer Nino Muñoz. Below and on the next pages are some excerpts from Ross‘ interview and more pics. 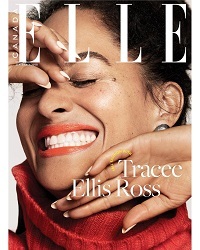 I’m sitting at a table in the rooftop garden at Soho House, Los Angeles, with actor and dir­ector Tracee Ellis Ross. Our glasses of rosé bead with condensation as the sunlight—a honey shade that seems to exist only in Hollywood—begins its gentle fade into dusk. We’re poring over a cellphone, alternating between tapping the screen and taking generous sips of wine. This setting feels, admittedly, like a clichéd opening scene for a new TV pilot about trying to make it in the big city (cue a “meet cute” with a hunky waiter and a synth-driven theme song), but there is absolutely nothing about Ellis Ross that follows a script.